You can make a donation to QCEA quickly and easily. However, if you'd like to take a more active role in supporting our work, there are several ways to do so. If you want to make a contribution to QCEA's important work, but also to stay informed about what we're doing and receive copies of our publications, why not consider becoming a QCEA Supporter? For a small contribution of just £40 / €40 per year, we'll send you regular news and information by email, as well as invitations to our events and paper copies of our newsletter, Around Europe. We'll also send you hard copies of selected QCEA publications. Both individuals and Meetings can become QCEA Supporters. 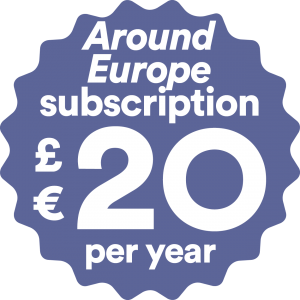 Alternatively, you can also subscribe to our newsletter, Around Europe, for just £20 / €20 per year. It's published five times per year, and we'll send you paper copies of each edition. If you're subscribing on behalf of a meeting, or would like to give our newsletter to friends and family, we can send you multiple copies - just let us know when you sign up. Ideal for smaller Meetings who still want to keep in touch with QCEA's work and hear news from us. To become a QCEA Supporter, or to subscribe to Around Europe, please select your currency. As of July 2018, our membership system has changed. 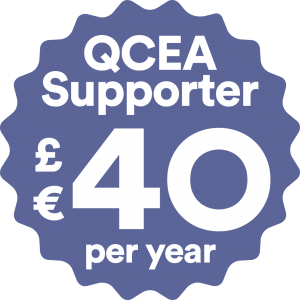 QCEA members are now known as "Supporters", and all Supporters' contributions are now set at £40 / €40 per year. But don't worry - you don't have to do anything, and you'll retain all the benefits of QCEA membership. When your membership is up for renewal, you'll simply be asked to contribute the new, lower rate. Questions? Contact us.